By 5000 B.C., hunters and gatherers had moved into the Nile River valley. They settled there, farmed the land, and built villages. These people became the earliest Egyptians. Because Egypt gets little rainfall, Egyptians relied on the Nile River for water. They used its water for fishing, farming, cooking, and cleaning. The Nile River flows north from the heart of Africa to the Mediterranean Sea, about 4,000 miles. Two rivers meet to form the Nile. They are the Blue Nile in eastern Africa and the White Nile in central Africa. The water forms rapids where the rivers meet. These are called cataracts. Large ships cannot sail through the cataracts. In Egypt, the Nile runs through a narrow valley. Just before it reaches the Mediterranean Sea, it divides into many branches. These branches spread out over an area of rich soil. This area is called a delta. Deserts lie on both sides of the Nile River valley. Because the deserts were so hot, the ancient Egyptians called them “the Red Land.” These areas kept outside armies away from Egypt. To the south, dangerous cataracts blocked enemy boats. In the north, the delta marshes kept enemies from sailing into Egypt. The geography of Mesopotamia did not protect people in the same way. The deserts and the rivers did not keep out invaders. Mesopotamians constantly fought off attackers. Egypt rarely faced such threats. As a result, Egyptian civilization grew and prospered. The deserts and Nile rapids did not completely close Egypt to the outside world. The Mediterranean Sea was to the north. Beyond the desert to the east was the Red Sea. These waters allowed Egyptians to trade with others. Within Egypt, people used the Nile for trade and transportation. Winds from the north pushed sailboats south. The flow of the Nile carried them north. This made Egypt different from Mesopotamia. There, city-states constantly fought each other. Egyptian villages, however, had friendly contact. Farmers in Mesopotamia never knew when the nearby rivers would overflow or if flooding would be bad. This made it difficult to farm there. In Egypt, the Nile River also flooded, but its floods were regular. Farmers did not have to worry that floods would destroy crops or farms. Water came to the Nile from rain and melted snow. Then, during the summer, the Nile spilled over its banks. When the waters went down, they left a layer of dark, rich mud. The Egyptians became successful farmers. They planted wheat, barley, and flax seeds. They grew enough food to feed themselves and their animals. They used irrigation when the weather was dry. To trap floodwaters, Egyptian farmers first dug basins, or bowl-shaped holes, in the earth. Then they dug canals to carry water from the basins to the fields. They used a shadoof, a bucket on a long pole. It could lift water from the river into the basins. Egyptians also developed ways to use papyrus. This was a reed plant that grew along the shores of the Nile. They harvested papyrus to make baskets, sandals, and river rafts. The Egyptians also used papyrus for making writing paper. Like the Mesopotamians, Egyptians developed their own system of writing called hieroglyphics. It was made up of thousands of picture and sound symbols. Some symbols stood for objects and ideas. For example, to communicate the idea of a boat, a scribe would draw a tiny boat. Other symbols stood for sounds, like the letters of our own alphabet. In ancient Egypt, few people could read and write. Some Egyptian men went to special schools to study reading and writing. They learned to become scribes, or record keepers for the rulers, priests, and traders. Some hieroglyphics conveyed public messages. Scribes carved these into stone walls and monuments. For everyday use, scribes invented a simpler script and wrote on papyrus. of farmers. Artisans wove cloth, made pottery, and carved statues. They also shaped copper into weapons and tools. Now Egyptians had goods to trade. First, they traded with each other. Then they traveled to Mesopotamia to trade. There they may have learned new ideas about writing and government. Irrigation systems needed to be built and maintained. Grain had to be stored. Disputes over land needed to be settled. Over time, a government formed in Egypt. By 4000 B.C., Egypt was made up of two large kingdoms. Lower Egypt was in the north in the Nile delta. Upper Egypt was in the south along the Nile River. kingdom stayed together long after his death. His family passed power from father to son to grandson. This is called a dynasty. Over time, ancient Egypt would be ruled by 30 dynasties over a period of about 2,800 years. Historians group Egypt’s dynasties into three main eras—the Old Kingdom, the Middle Kingdom, and the New Kingdom. Each kingdom had a long period of strong leadership and safety. and expanded trade. Their kings, or pharaohs, set up a government. Egypt was a theocracy. That means that the pharaoh was both the political and religious leader. The pharaoh had total power. He could use all the land in Egypt any way he wanted. His orders were obeyed without question. 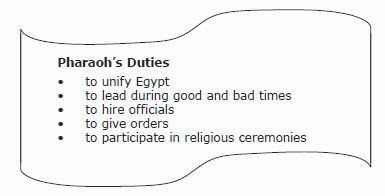 Pharaohs appointed officials called bureaucrats. They were in charge of irrigation canals and crop planting. They made sure grain was saved to help people get through hard times. Bureaucrats also controlled trade and collected tax payments from farmers. As religious leader, a pharaoh participated in ceremonies that helped the kingdom. For example, he was the first to cut the grain at harvest time. Egyptians believed their pharaoh was the son of Re, the Egyptian sun god. They believed he protected the people during hard times. Religion affected every part of Egyptian life. Egyptians worshiped many gods and goddesses. They believed that the gods controlled nature. The sun god, Re, was important because the sun was necessary for good crops. Egyptians believed that life after death was better than the present life. They thought that the dead made a long journey. At the end, they reached a place of peace. The Book of the Dead was a collection of prayers and magic spells. Egyptians studied it, learned the spells, and tried to lead good lives. They believed that if they did these things, the god Osiris would grant them life after death. For centuries, Egyptians believed that if the pharaoh’s soul reached the afterlife, he would continue to protect Egypt. To live in the afterlife, the pharaoh’s soul needed a body. Eventually, Egyptians believed all people could reach the afterlife. They developed a process called embalming to protect the body. It involved removing organs from the dead body and then drying and wrapping the body in cloth. Embalming taught the Egyptians about the human body. They learned how to treat illnesses. They wrote down what they learned in the world’s first medical books. bodies from floods, wild animals, and grave robbers. They also held the things the pharaoh might need in the afterlife, such as clothing, furniture, and jewelry. Thousands of people worked for many years to build a pyramid. Farmers, surveyors, engineers, carpenters, stonecutters, and enslaved people all worked on pyramids. Workers found the stone. Artisans cut it into blocks. Others tied the blocks to wooden sleds and pulled them to barges, or boats. The barges floated to the building site. There workers unloaded the blocks, pushed them up ramps, and set them in place. Each pyramid sat on a square base with a north entrance. To find true north, the Egyptians studied the sky. and geometry to do this. About 2540 B.C., the Egyptians built the Great Pyramid. It is located about 10 miles south of the modern city of Cairo. It is one of three pyramids still standing in Giza. The Great Pyramid is about the height of a 48-story building and is made of more than 2 million stone blocks. Every Egyptian had a place in society. The pharaoh and his family were at the very top. The upper class lived in cities and on large estates along the Nile. Servants waited on them. The middle class ran businesses or made goods. They lived in smaller homes. 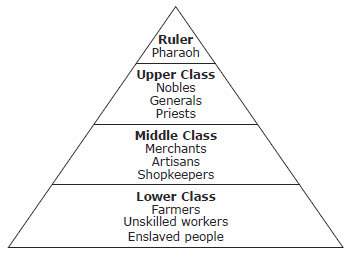 Egypt's lower class was its largest class. Most farmers lived in one-room mud homes. Unskilled workers lived in small homes with dirt floors. In ancient Egypt, the father headed the family. Women had the right to own property, buy and sell goods, and get divorced. Few Egyptians sent their children to school. Mothers taught their daughters to run a household. Boys learned job skills from their fathers. The Middle Kingdom lasted from about 2055 B.C. to 1650 B.C. It was a time of power, wealth, and achievement for Egypt. During the Middle Kingdom, Egypt took control of new lands. The pharaoh required tribute, or payments from the conquered peoples. The pharaoh used this wealth to build dams and improve farmlands. The pharaoh also built a canal between the Nile River and the Red Sea. ● Arts and architecture grew more popular. ● Painters covered tombs and temples with colorful scenes. ● Sculptors created large carvings of the pharaohs, which showed the pharaohs as ordinary people. ● Pharaohs had their tombs cut into cliffs. The Middle Kingdom ended when nobles tried to take power from the pharaohs. This fight weakened Egypt, making it easy to conquer. Outsiders, known as the Hyksos, invaded from western Asia. The Hyksos army rode in chariots and used weapons made of bronze and iron. The Egyptians had copper and stone weapons that could not stop the invaders. The Hyksos ruled Egypt for about 100 years. During that time, the Egyptians learned how to make and use Hyksos weapons. Around 1550 B.C., an Egyptian prince named Ahmose formed an army and drove the Hyksos out of Egypt. Ahmose’s rule began an era known as the New Kingdom. From 1550 B.C. to 1070 B.C., Egypt grew richer and more powerful. Most pharaohs focused on bringing other lands under their control. About 1473 B.C., a queen named Hatshepsut came to power. First she ruled with her husband. After he died, she made herself pharaoh and ruled for her young nephew. She became the first woman to rule Egypt by herself. gold, ivory, and ebony wood. Traders also brought incense, a material burned for its pleasant smell. One important trading partner was Phoenicia. The Phoenicians lived on the Mediterranean. They had their own alphabet and system of writing. The Phoenicians traded goods all over the ancient world. New Kingdom rulers also sent envoys, or representatives, to other rulers. This was the first time in history that a group of nations worked together in this way. When Hatshepsut died, her nephew, Thutmose III, became pharaoh. Thutmose expanded the empire through war. His armies extended the northern border of Egypt. His troops also took back control of Nubia, which had broken free from Egypt. The empire grew rich. It took gold, copper, ivory, and other goods from conquered peoples. Egypt also enslaved prisoners of war. However, it did let enslaved people own land, marry, and gain their freedom. About 1370 B.C., Amenhotep IV came to the throne. He and his wife, Nefertiti, tried to lead Egypt in a new direction. The pharaohs were losing power to the priests, so Amenhotep IV started a new religion. People could worship only one god, called Aton. When the priests protested, Amenhotep IV removed many from their positions. He seized their lands and closed their temples. He changed his name to Akhenaton, or “Spirit of Aton.” He began ruling Egypt from a new city. Most Egyptians refused to accept Aton as the only god. They still worshiped many gods. The priests of the old religion were unhappy about losing their power. Army leaders believed Akhenaton was so devoted to his new religion that he did not do his job as pharaoh. Outside invaders took most of Egypt's lands in western Asia. The most successful leader during the New Kingdom was Ramses II. Ramses II came to power in 1279 B.C. He took back much of the territory lost by earlier pharaohs. He fought the Hittites in what is now Turkey and signed peace treaties. The Hittites and the Egyptians agreed to keep peace between them. They agreed to fight together if an enemy attacked one of them. Under Ramses II and other New Kingdom leaders, many temples were built. The most magnificent temple was Karnak at Thebes. Karnak still impresses visitors today. After Ramses II, Egypt’s power faded. Egypt was attacked by groups with more and better weapons. By 1150 B.C., Egypt ruled only the Nile delta, a small area. Starting in 900 B.C., one outside group after another took over Egypt. These outside groups included the Libyans, the people of Kush, and the Assyrians from Mesopotamia. later became known as Kush. Today this area is the country of Sudan. The first Nubians were cattle herders. Their cattle grazed on savannas, or grassy plains. These savannas still stretch across Africa south of the Sahara. Nubia got plenty of rainfall throughout the year. As a result, farmers did not need water from the Nile River. They settled in villages and grew crops such as beans, yams, and rice. The Nubians also hunted for food. They were very skilled at using bows and arrows. Over time, stronger Nubian villages conquered weaker ones. In this way, the kingdom of Kerma was formed. Farming and gold mining made Kerma wealthy. The location of the kingdom in the Nile valley helped Kerma become an important trade center. It connected Egypt with the tropical areas of southern Africa. The Egyptians traded with Kerma for cattle, gold, ivory, giraffes, leopards, and enslaved people. Egyptians also hired Nubians to fight in their armies because of their skills in battle. tombs with their personal belongings. These belongings often included gold, jewelry, and pottery. In the 1400s B.C., the armies of Egyptian pharaoh Thutmose III invaded Nubia. After a 50-year war, Kerma collapsed. The Egyptians ruled it for the next 700 years. During this time, the people of Nubia adopted many Egyptian beliefs and ways of doing things. For example, they worshiped Egyptian gods and goddesses along with their own. They worked with copper and bronze to make tools. They also adapted Egyptian hieroglyphics to their own language and created an alphabet. By 850 B.C., the Nubians had formed the kingdom of Kush. Powerful Kushite kings ruled for the next few centuries. Their capital was the city of Napata. It was located along the upper part of the Nile River. Trade caravans carried gold, ivory, valuable woods, and other goods from central Africa to Kush and then on to Egypt. In time, Kush became strong enough to stand up to Egypt. About 750 B.C., a Kushite king named Kashta headed north. He began the conquest of Egypt. After Kashta died, his son Piye completed the conquest in 728 B.C. He ruled both Egypt and Kush from the city of Napata. Even though the Kushites had become the rulers, the people continued to have a high opinion of Egyptian culture. The kings of Kush built temples and monuments similar to those built by the Egyptians. The people of Kush built small pyramids in which to bury their kings. They also continued to believe in Egyptian gods. Kush’s rule over Egypt was short. In 671 B.C., the Assyrians invaded Egypt. They drove the Kushites back to their homeland. The Kushites, however, gained something from the Assyrians—the secret to making iron. The Kushites became the first Africans to make iron. Soon, farmers in Kush could use iron to make stronger plows. With better tools, they could grow more crops. Kush’s warriors also began using iron spears and swords. In about 540 B.C., Kush’s rulers moved to the city of Meroë. It became the capital city. Like Napata, the new capital was near the Nile River. In addition, the land near Meroë had iron ore and trees for fuel. As a result, Meroë became an iron-making center. Kush’s kings rebuilt Meroë to look like an Egyptian city. It included small pyramids, a grand avenue, and a huge temple. 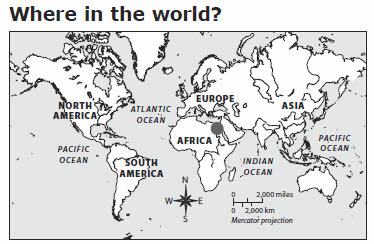 Meroë also became an important center of trade in the ancient world. Kush’s traders received leopard skins and valuable woods from other places in Africa. They traded these items, plus iron products and enslaved workers for cotton, textiles, or woven cloth, and other goods. Kush stayed a powerful trading kingdom for nearly 600 years. By the A.D. 200s, the kingdom began to weaken. Then another kingdom called Axum came to power. Axum started near the Red Sea in eastern Africa. It was located in the present-day country of Ethiopia. Around A.D. 350, the armies of Axum invaded Kush and destroyed Meroë.